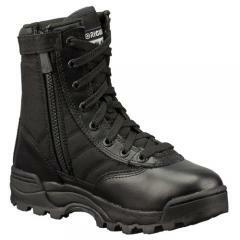 Original SWAT duty boots are designed to give you the same comfort, fit and performance as a pair of cross-trainers. Original SWAT has done two very important things with the introduction of this fine line of boots. First, by developing an all new 'last' - drawing heavily on European comfort footwear technology to get an orthotically correct shape. Second, by using modern materials and technology usually found in athletic footwear manufacture. The result is a product that has changed the uniform boot market forever setting new standards in fit and comfort. Fit and look great. Good quality. Buy a new pair every year. Walk all day in them and your feet feel great.